Space Rogues 3 is here! with Comments Off on Space Rogues 3 is here! Well, ALMOST, here. Space Rogues 3: The Behemoth Job will be released on December 24th, but IS available for Pre-Order now. The crew of the Ghost is back for another adventure! Well they never left, but you know what I mean. I’m really excited to share this latest adventure with you all. I’m already hard at work on Space Rogues 4: The Horror Story Job (Not a working title, that’s really it) but can’t wait to hear what you think of book three! 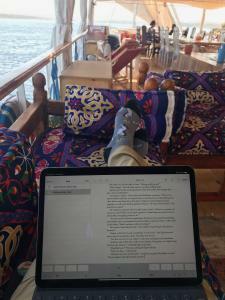 Part of Space Rogues 4 was written while drifting down the Nile river on a dahabiya, but enough about Book 4, we’re here to talk about Book 3! Part of writing a series is having everything move forward, including the characters. The series I love the most let the characters grow and change. I’m hoping book 3 captured some of that effort with the crew. How’s your 2018 reading coming? How many books? favorite?